Congratulations to Nawas on the completion of his CIRM Bridges to Stem Cells Research internship. Nawas presented his finding on the expression of glycosolation enzymes in neural stem cells at the Stem Cell Symposium at CSU Fullerton and at the CIRM BSCR Conference in San Francisco. Nawas and his two favorite things: science and food! The Flanagan Lab welcomes two new students: Boss Povieng, a Junior Biology major, and John Louie, a SURF-IT participant. Chesca Barrios wins Biological Sciences award! Congratulations to Chesca Barrios! 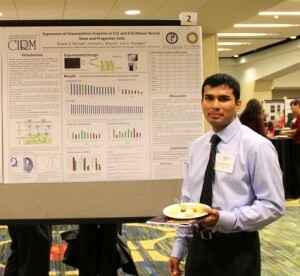 Her UROP poster was awarded the Robert Ernst Prize in Biological Sciences during the Undergraduate Research Competition. Well done!